Located in the Ocean Drive section of North Myrtle Beach, SC, this North Myrtle Beach resort puts the dancers in your family near the popular beach clubs where shag dance steps take over the dance floor. Mar Vista Grande is a terrific North Myrtle Beach resort with an incredible oceanfront sun deck. The North Myrtle Beach vacation rentals at Mar Vista Grande are spacious and grand. Everyone in your family will love your North Myrtle Beach vacation at this resort. There is much to see and do on site, not to mention the glorious Atlantic Ocean that is right outside. Mar Vista Grande is an oceanfront retreat with a parking garage. There is a wooden walkway at Mar Vista Grande that leads guests from the pool deck to the white sandy beaches. Kick off your sandals and let your toes sink into the warm sand. Comb the beautiful beachfront for seashells that make excellent souvenirs of your North Myrtle Beach vacation. Race to the water’s edge and jump the crashing waves with your kids. Build sand castles, go for a run and watch an early morning sunrise during your North Myrtle Beach vacation at Mar Vista Grande in North Myrtle Beach. The pool deck at Mar Vista Grande runs the entire length of this North Myrtle Beach resort. And it is on the oceanfront. So while you lounge in a comfortable chair or underneath an umbrella around the lazy river, you can listen carefully for the sound of the waves and seagulls on the beach. There is a lazy river at Mar Vista Grande that is ideal for all ages. Hop into an inner tube and let the lazy river’s current lead you downstream. 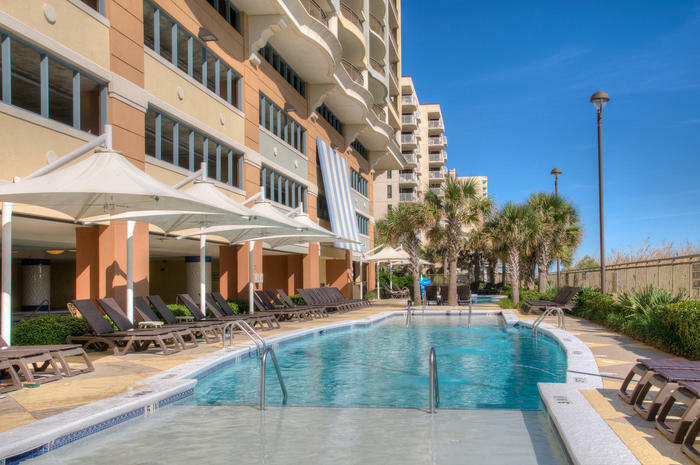 The swimming pool at this North Myrtle Beach resort is a welcome respite when the temperature rises. Go for a swim in the sparkling blue swimming pool and cool off while getting a suntan. Elliott Beach Rentals is not affiliated with onsite management or the HOA of Mar Vista Grande.